Amsterdam has one of the highest rates of cycling for transport in the world. It wasn’t always so! 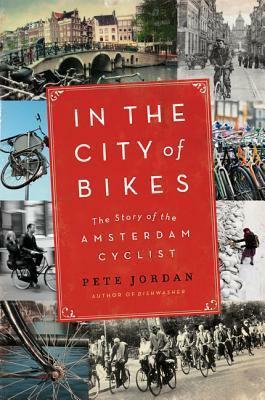 I recommend you read In the City of Bikes: The Story of the Amsterdam Cyclist by Pete Jordan (available at the Geelong Regional Library) to find out how Amsterdam transformed itself into a cycling Mecca. This is despite the fact that for much of the year, Amsterdam has an unfriendly climate for cycling. With Geelong’s easy terrain, wonderful climate and the beginning of the Principal Bicycle Network, we’d love to see Geelong transformed to a place where cycling is the norm. 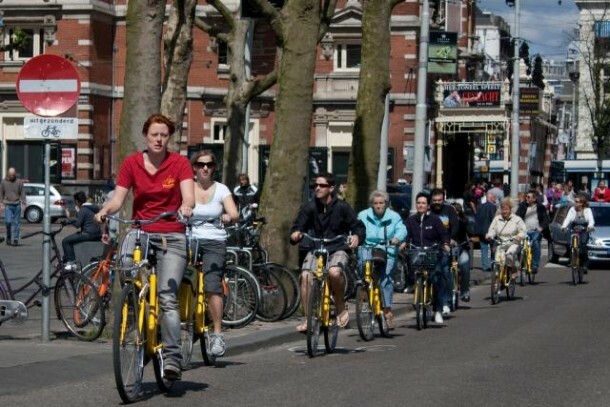 For more, here is an article on the five reasons why Amsterdam works so well for bikes. Underlying all this is designing transport for people rather than cars. In a city with a greater urban area population of 1.8 million people, traffic deaths are 2/100,000 of population. Australia’s rate of traffic fatalities is close to triple this. Look at any photo of people cycling in Amsterdam. You’ll see mixture of male and female, ages and many assorted bicycles. One measure of how well our infrastructure makes cycling safe is the percentage of females riding bikes. This entry was posted in Bicycle Advocacy, Bicycle commuting, Book Reviews, Cycling Safety, Sustainable transport by hlyth2013. Bookmark the permalink.